Carnival Corp held their conference call today to discuss their first quarter earnings, and as expected, more information came out about the nine-ship order the company announced yesterday. Some of it was volunteered, and some of it came in answers to questions from analysts. Bravo has renewed their partnership with Celebrity Cruises through 2016. The program brings Top Chef-inspired menus aboard the line’s fleet as well as Quickfire Challenges for fans of the show. Once a year the line offers a Top Chef Signature Sailing where passengers get to interact with “cheftestants” from the show. This year’s installment will sail on November 14 aboard Celebrity Reflection. Carnival Corp announced an order of nine cruise ships for its brands to be delivered between 2019 and 2022. Five were ordered from Italian builder Fincantieri, and four were ordered from Meyer Werft who will build them in both their German and Finnish yards. Carnival said the ships will be built to the specifications of each brand, but declined to disclose at this time which brands would be receiving the new ships or the timing. The complete story appeared in the March 26 edition of Cruise News Daily. The US Coast Guard suspended their search for the 43-year-old man who went overboard from Liberty of the Seas Sunday night. MIAMI, March 25, 2015 -- Carnival Corporation & plc (NYSE/LSE: CCL; NYSE: CUK), the world's largest travel and leisure company, today named Julia M. Brown to the newly created role of Chief Procurement Officer (CPO) overseeing strategic sourcing and supplier relationship management. As part of this new role, Brown will work closely with the company's nine brands and their support groups to strategically procure goods and services to further strengthen the company's supplier relationships and leverage its global scale. "We are excited to have Julia join us as part of our global management team and take on this new role that will be critical in helping us further leverage our scale, accelerating our drive to double-digit returns on invested capital," said Arnold Donald, president & CEO for Carnival Corporation & plc. "I've had the opportunity to get to know Julia through our mutual association with the Executive Leadership Council, and she not only has an exceptional track record of leading procurement at companies with massive global operations, but also has a highly strategic and collaborative approach that will help us partner more closely with our suppliers to exceed guest expectations and drive value for the business." Carnival Corporation's Chief Operations Officer Alan Buckelew added, "As we have become increasingly global, the role of coordinating our procurement and supply chains has become more and more complex. At the same time, our global sourcing function creates opportunities for us to improve guest experiences onboard our ships and collaborate across our brands to operate more efficiently. Julia brings a depth of leadership and experience that will help us capitalize on those opportunities, as we build on the success our teams have already achieved." Brown will report to Josh Leibowitz, chief strategy officer for Carnival Corporation, and will be based at the company's headquarters in Miami. "Julia is a highly respected individual with a collaborative and engaging style that has earned her a strong reputation for being able to build and inspire global teams. She will be an incredible addition to our global leadership team, and we're excited to see her positive impacts on our organization," said Leibowitz. "Our brands are increasingly working together to deepen relationships with our suppliers, so I look forward to working closely with Julia and our brand leaders to amplify those efforts, drive strategic sourcing partnerships and support our strategy to leverage our scale and exceed guest expectations." Brown has been named as one of the top 100 most "Influential Blacks in Corporate America" by Savoy Magazine, the top 100 Women to Watch by Today's Chicago Woman and listed in Black Enterprise's Top 75 Most Powerful Women in Business. Royal Caribbean said this morning they will homeport the third Quantum-class ship, Ovation of the Seas, at Tianjin, China. Ovation will expand Royal Caribbean International's deployment in the Chinese market to five ships - Ovation of the Seas, Quantum of the Seas, Mariner of the Seas, Voyager of the Seas and Legend of the Seas - becoming the largest cruise fleet in China for any cruise brand. They are homeported at four Chinese metropolitan markets - Shanghai, Tianjin, Hong Kong and Xiamen - and sail three- to 12-night itineraries to destinations in Japan, Korea, Taiwan and Vietnam. Apparently Ovation of the Seas will go to China immediately after delivery from Meyer Werft. It will be positioned to China with a 52-day cruise from Southampton to Tianjin departing Southampton on May 3, 2016. (It will also be sold in five segments.) That cruise will open for sale today (March 26, 2015). Norwegian Star is leaving the Mexican Riviera soon for Europe, but before it goes, it just spent two weeks in dry dock getting new features above the waterline and enhancements as part of the maintenance below the decks. Since it returned to service last week, thanks to the new features, some passengers have been “wasting away in Margaritaville,” while others have been imagining themselves in Argentina for dinner. Disney Cruise Line said today they will operate their first British Isles cruise during the summer of 2016. The 12-night sailing aboard Disney Magic will embark from Dover on June 5, 2016, and comes amid Disney Magic’s summer program in Northern Europe and is Disney’s first time sailing to these British ports. Details appear in the March 24 edition of Cruise News Daily. It’s that time of year again, and passengers aboard last week’s Crown Princess sailing were treated to performances by all the finalists in Princess’ Entertainer of the Year contest so they could vote for the winner. Comedic Magician Ben Seidman was chosen as the winner of the title and a $5,000 cash prize, after passengers saw all four finalists perform. Sunday night about 9pm a passenger aboard Liberty of the Seas reported that another passenger may have gone overboard. A review of the video recordings confirmed it was a 47-year-old passenger who did climb over the railing on Deck 12 and go overboard. Deck 12 is relatively deserted at night with the jogging track behind the spa and children’s facilities at the aft. The ship’s position was noted and the ship turned to begin a search for the man, The event was reported to the relevant authorities. The complete article appeared in the March 23 edition of Cruise News Daily. Things are different now that Carnival Legend is sailing in the South Pacific rather than the western Caribbean. 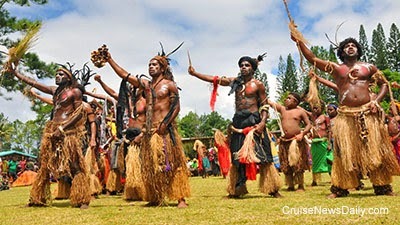 For example, last Friday, when Carnival Legend called at Lifou, New Caledonia, the ship’s officers were invited to attend the coronation of the island's new chief. It’s an event that only occurs every 25-30 years, so Carnival Legend was in port on just the right day. It was a day of celebration with dancing and a traditional lunch, hosted by the newly ascended Grand Chief and his leaders. The officers who attended, led by the staff captain, enjoyed a day of celebration with dancing and a traditional lunch, which was hosted by the newly ascended Grand Chief and his leaders. MIAMI, March 23, 2015 -- Carnival Corporation & plc (NYSE/LSE: CCL; NYSE: CUK), the world's largest travel and leisure company, today named James Chedgey as vice president of global financial planning and analysis, responsible for working with senior management throughout the company to find new ways to enhance shareholder value. As part of the role, Chedgey will be integral in helping to develop Carnival's corporate strategy, determining its public earnings guidance, and providing analytical support on long term planning and monthly forecasting, all of which will be key foundational contributors to the future success of the company. He will also work with the company's senior leaders to ensure operational strength and financial flexibility across Carnival Corporation's portfolio of nine brands. "James brings more than 15 years of financial experience, and with his proven success supporting and engaging multiple cruise brands in his previous role, we're excited to transition him into this global position," said David Bernstein, chief financial officer for Carnival Corporation. "With our expanding global operations, new markets, new destinations and nine new ships scheduled to be delivered between now and 2018, James will play a critical role in positioning the overall growth strategy and financial direction of the company." Chedgey will report to Josh Weinstein, treasurer of Carnival Corporation, and will be based at the company's headquarters in Miami, relocating from Southampton, England where he previously served as corporate finance and planning director for Carnival UK. As part of that role, which he assumed in January 2013, Chedgey led the annual and long-term planning process for the company's P&O Cruises and Cunard brands and partnered with the executive team in driving efficiencies into the company's processes to support business objectives. Chedgey started his career at PricewaterhouseCoopers in London in 1999 before moving to BDO International. Following that, he spent more than four years at Charter International, a British engineering business. Most recently, Chedgey served in various roles of increasing responsibility with Royal Mail, including head of transformation finance operations. He is originally from England and graduated from the University of Birmingham with a Bachelor of Commerce in business administration. Chedgey is a Chartered Accountant, earning his ACA qualification from the Institute of Chartered Accountants in England and Wales. Together, these brands operate 101 ships totaling 216,000 lower berths with 9 new ships scheduled to be delivered between 2015 and 2018. Carnival Corporation & plc also operates Holland America Princess Alaska Tours, the leading tour companies in Alaska and the Canadian Yukon. Traded on both the New York and London Stock Exchanges, Carnival Corporation & plc is the only group in the world to be included in both the S&P 500 and the FTSE 100 indices. Additional information can be found on www.carnival.com, www.hollandamerica.com, www.princess.com, www.seabourn.com, www.aida.de, www.costacruise.com, www.cunard.com, www.pocruises.com.au, www.pocruises.com.